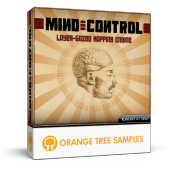 Give your sample libraries a mind of their own with Orange Tree Samples' MIND CONTROL add-on for KONTAKT 4. MIND CONTROL maximizes KONTAKT's "instrument bank" feature, which allows you to drag entire sample libraries into KONTAKT. It introduces a user-friendly master interface to let you create rules for how KONTAKT should automatically switch between sample libraries, making sequencing or performing more convenient and intuitive.